Want to turn your iPad into a PADD from Star Trek? I thought so. The PADD is one of the most famous science fiction devices of all time and is a device that many people, including me, credit with predicting the existence of the iPad 20 years before it hit the market. Now, you can turn your iPad into the all purpose computing device that all of the Star Trek: The Next Generation crew carried around the Enterprise by snagging the official app! 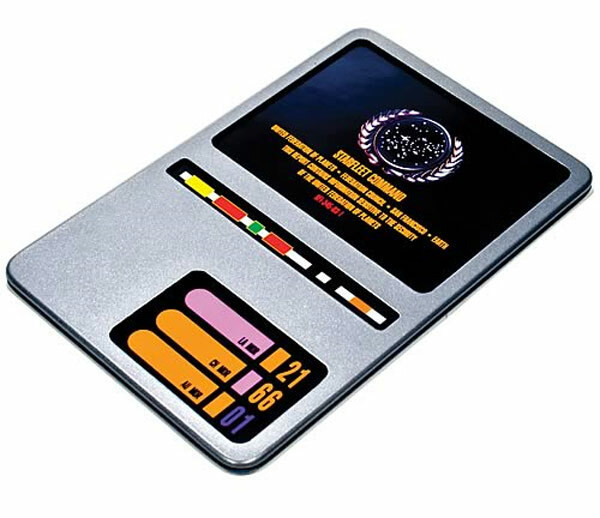 The Star Trek PADD [App Store, $4.99] app imitates the look of the LCARS (Library Computer Access and Retrieval System) user interface that all of the computers on the TNG Enterprise used. In addition to all of the appropriate sound effects, you’ll also get voice prompts from a soundalike of the original computer voice, the late Majel Barret Roddenberry. The app also includes a database of ST:TNG information including alien races, ship models, locations and tech. There’s also a detailed episode guide. If you want to connect with other Trekkers, there’s also Facebook and Twitter integration that links up with the official pages and accounts. If you want to use it for desk candy, there are two self-running diagnostic modes with a schematic of the Enterprise NCC-1701-D.
For all of you true nerds out there, yes, Michael Okuda, the interface designer of the Starships Enterprise and the author, along with his wife, Denise, of the Star Trek Encyclopedia was involved with this project. I can’t tell you the amount of times that I’ve thumbed through Okuda’s TNG Technical Manual poring over the details of the Enterprise I grew up with. I love that he’s involved with the project. “Back when the PADD first appeared on ST:TNG, none of us imagined that today we’d be able to hold the real thing in our hands. But the Star Trek PADD app, running on your iPad, is an actual miniature, handheld, touch-sensitive, 24th-century-style computer screen,” says Okuda. I couldn’t resist the pull of the Trek and snagged it myself. It’s definitely worth checking out if you’re into this sort of thing. The sounds and look are all completely accurate and I love that there’s even the hum of the starships’ engines in the background. It’s pretty extensive and contains a lot of the information that’s in the Star Trek Encyclopedia, although some of the entries appear to be shortened. Anything that has an entry anywhere else in the app is handily crosslinked. If you’re looking for a way to turn your iPad into the PADD you’ve always wanted, giving you a way to browse an encyclopedia’s worth of Star Trek info, snag the PADD app. Oh, let it sit there for a couple of minutes for the cool engine and ships diagnostic screens.